Takoma Fire Softball is a competitive fastpitch softball program dedicated to providing girls age 8 and up with an intensive, meaningful, and most of all fun softball experience, by developing and using softball skills. We emphasize high level skills development. Fire teams have taken the field each summer since 2004. Most recently, Fire teams have competed in World Series play at several venues. We are nominally a Takoma Park/Silver Spring (Maryland) organization but we recruit from all over Montgomery and Prince Georges County, DC, and even Virginia. 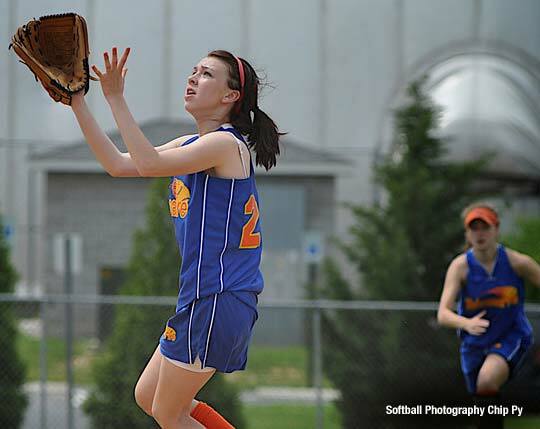 We participate in regional as well as travel softball tournaments and local leagues, Spring, Summer and Fall. Our teams travel to and play in weekend tournaments around Maryland and northern Virginia. We play at several levels of competition, with each team deciding if they will play “B”, “C”, “Open” or other levels of play. Some teams also play in leagues on weeknights. Check with the team at your age level to see where, when and at what level of competition they play at. We hold clinics year round including indoor programs in the winter. Our clinics and programs cover pitching, catching, batting, fielding, base running, conditioning, strategy, and sportsmanship. We hire renowned trainers and coaches for these programs. At the younger levels emphasis is on fundamental skill development and fun. At the higher levels there is more emphasis on the finer points of the game. Most girls who continue with our program play high school softball; some go on to play college ball. Currently there are several Fire Alumni playing NCAA softball. * How softball enriches their lives and helps build character. Most of the younger girls in the program also play in TPSS Baseball And Softball. The Takoma Fire girls all want to take their play up to the next level! More on Takoma Park Softball can be found below. Takoma Softball operates under the umbrella of Takoma Park Youth Baseball, a 501 C3, tax-exempt non profit organization which also sponsors TPSS Baseball. Takoma Softball aims to provide community-based playing and training opportunities to recreational players ages 7 through 12 on local Takoma Park and Silver Spring fields. Takoma Softball also offers spring skills clinics in cooperation with Montgomery Blair High School Softball Program and , in Winter, through Takoma Fire. Teaching skills to the girls in clinics and while they play games in an atmosphere of fun so that they will love softball. Providing professional umpires for all Seniors games. Providing opportunities for all girls to compete at either “rec” level (the current teams play rec) or at “select” level with Takoma Fire (which would include more intensive training and opportunities to play in tournaments , especially when the rec season is over). More opportunities for coaches to improve their coaching skills.